Hindu gods and goddesses use various conveyance modes for their travel and mobility. They are called Vahanas or vehicles. They serve the same purpose as today’s modern vehicles suitable for travel by air or land or water or even interstellar travel. The gods of the upper worlds use them for both travel and warfare. The Vahanas are mostly animals or mythical creatures. They are not mere animals or beasts of burden but divine beings who possess divine wisdom and assume fierce forms in the battlefield. Most of them are also treated with respect and worshipped by devotees with offerings of food and prayers. The idea of vehicle or Vahana is rooted in the Vedas. The gods live in the higher worlds. They use the Vahanas to travel from world to world or to visit their devotees and other divinities. When a sacrificial ceremony is performed upon earth, they descend to the earth in their respective vehicles to the sacrificial place to receive their offerings. They also use them to perform their duties. The Vedas describe how the god Surya (sun) travels in the sky everyday, riding upon a golden chariot, drawn by seven horses, radiating light and filling the world with Prana. Before the storm, the Maruts and Rudras appear in the sky riding their horses, carrying weapons and wearing colorful attires to disperse water bearing clouds in a riotous display of valor. Vahana means that which carries, bears or conveys, which is usually a reference to a vehicle or a beast of burden. It is derived from the word vaha means bearing, carrying. It is also a reference to a stream or a flow. Hence, a river is known as Vahini, that which carries. In Hinduism, Vahanas have a great significance as the Vehicles of gods and goddesses. Each Hindu deity has a Vahana which is usually an animal, bird, or a mythical creature. The Vahanas are divine because they are forever in contact with the deities they serve. Because of their constant association and presence in the vicinity of them, they partake their divine nature and reflect their qualities. They are also great devotees who exemplify the highest form of devotion and serve as role models to the devotees upon earth. In the following discussion, we explain the importance of the Vahanas and their purpose in creation, including their symbolic significance. Gods are omniscient and omnipresent. They can be anywhere and everywhere. By a mere thought, they can manifest in any part of the universe in any instant. The question then arises is why do gods who are so powerful and omnipresent require any vehicle at all? For example, if you have the supernatural ability to go anywhere in an instant by the power of your mind, would you still maintain a car and waste money on the fuel? Besides, the gods themselves serve as the support for others. The whole universe is supported by Isvara, the Supreme Being, and the gods he created uphold the worlds and beings to ensure their order and regularity. Then why do they require another support? This is one of those mysteries, which cannot be easily answered. The Vahanas not only serve as carriers but also perform many other tasks. They also have a deeper spiritual significance, in the liberation of beings. The following are the important purposes for which the Vahanas are meant in creation. From a superficial perspective, the Vahanas elevate the status of the deity and serve as status symbols to denote the strength, potency and rank of the deity in the pantheon. For example, Indra's Vehicle is a white elephant. Elephants are usually associated with royalty. Hence, Indra's Vehicle denotes Indra's position as the king of the heaven and as a warrior king. The Vahanas are essentially divine carriers with incredible mobility. They denote the responsiveness of the deity and how quickly he may respond to the calls of devotees for help. The Vahanas mostly belong to the animal world and play an important role in the order and regularity of the world. They signify the divine nature of whole creation and the interdependence of all beings in God’s creation. The Vahanas are powerful creatures. They complement and augment the powers and potencies of the deities with their own. For example, Vayu has thousands of horses upon which he swiftly rides. They add to his strength and swiftness. Tiger, the vehicle of Durga strengthens the fierceness and destructive power of the Mother Goddess. The Vahanas are not mere vehicles. They double as guards and allies of their masters in wars and make them even more formidable. Sometimes they fight wars on their own or at the behest of their masters as the first line of defense to save them time and effort. The Vahanas have a role and purpose in creation. They help the deities to uphold Dharma by performing several obligatory and secondary duties. Vahanas such as Nandi and Garuda serve as divine messengers and teachers and often help the devotees on their own or at the behest of their masters to achieve liberation. The Vahanas are not mere animals. They are divine beings, worthy of worship and veneration, with the ability to grant knowledge and liberation on their own. The vehicles of popular deities are installed in temples as secondary deities and worshipped by devotees. As stated before, the Vahanas have a deeper symbolism. They denote the elements over which the gods have control. For example, Vishnu represents the element space (akasa). He is the lord of the sky and the mid-region which are filled with the rays of the Sun. His color is blue or dark, which is the color of the sky during the day and night respectively. Because of his association with the Sun, who rules the sky, he is considered a solar deity. Therefore, a bird like Garuda who can travel across space and the mid-region is ideal for him as his vehicle. Shiva is an earthly god who makes the earth and the beings fertile. He was traditionally worshipped by the common people of the earth who worked in the agricultural fields and harvested the crops. He is also the lord of the animals (Pasupathi) who derive nourishment from the earth and in turn nourish the humans. Hence, the Bull is very much suitable for him as his vehicle. Brahma is the god of water element, which represents the mind or the consciousness. He purifies the mind and enlightens it with sacred knowledge and discerning wisdom. Hence, a bird like Swan which moves effortlessly in water with the ability to separate the impurities from water is ideal for him as his vehicle. Further, the Vahanas represent the power and the lordship of the deity over the energies and tattvas of Nature. They also denote the overriding and neutralizing power of the gods over certain aspects of creation and their ability to control and transform the negative energies, qualities, impurities, tendencies and attitudes that are present in us or in creation. The Vahanas symbolize all that negativity and darkness which prevent us from achieving liberation or experiencing peace and happiness. For example, Goddess Durga has control over the destructive powers and dark emotions as represented by lions, tigers and such fierce animals. Hence a tiger or a lion is described as her vehicle. Kartikeya, rides over peacock. It represents egoism and vanity. Agni rides upon a goat, which symbolically represents impurity, lust and desires. By sacrificing them in fire one can attain good merit. The gods of Hinduism have mostly animals, birds and mythical creatures as their Vahanas. However, you rarely come across instances of humans serving as Vahanas. Probably the gods do not choose humans as their vehicles for certain valid reasons. Firstly, the human body is not fit to serve as a carrier. Secondly, human beings are meant for a different purpose in creation. They have to perform obligatory duties and sacrificial actions to nourish the gods and ensure the order and regularity of the world. Thirdly, human beings have the spiritual potential to achieve liberation through self-effort and surpass even gods. In the entire creation, only humans can transcend their limitations and achieve liberation. As part of their obligatory duties, gods may help humans achieve liberation, but cannot achieve liberation on their own unless they take birth upon earth as humans. Hence, although they are placed below the gods in the hierarchy, technically they are their equals or superior. Lastly, although the Vahanas are animals, birds or mythical creatures, they have anthropomorphic forms and act in many ways like humans. In some images, Kubera, the lord of wealth, is depicted as riding upon the shoulders of a human being. It is not clear why it is so. According to some accounts, Kubera rides upon an aerial vehicle or space machine called the Pushpak Vimana. In Treta Yug it was stolen from him by Ravana. After his destruction, Rama used it to return to his capital, Ayodhya. Kubera probably regained the possession of it. It is therefore a mystery the Vahana of Kubera is a human being. Kubera is not a god but an Yaksha. The Yakshas are known for their divine as well as demonic behavior. His human Vahana probably represents their mixed nature, which is also typical to humans. It may also symbolically represent human greed, pride and selfishness, which wealth induces in humans. The relationship between the deity and the Vehicle is not merely that of a master and servant, but almost that of a father and son, or the body and the soul. Outwardly they may appear as two entities, but internally they are united and share the same consciousness as in case of an embodied being (jiva). The Vehicles or the Vahanas cannot be considered mere animals or creatures because they are endowed with the knowledge and power of the deity, which is superior to that of humans. If deity is the soul, the Vahana is his physical aspect representing the duality of beingness. In this regard, the body of each living being serves as a Vehicle for the embodied soul. In some cases, the Vehicles also double as guardians to the gates of the deity's sphere or world, which means that without their permission you cannot reach the deity. Ignorant people may view them as mere animals or means of transportation, but they have deeper symbolism. During the domestic or ritual worship (puja) in Hinduism, it is customary for worshippers to create an image (arca) of the deity or use an already created one to conduct the worship. After the image is installed in a due manner and purified, they invite the deity to enter the image and breath life into it saying "avahayami," which means, "please come and enter the image, accepting it as your Vehicle." Thus, during Hindu ritual worship each image worshipped by the devotees becomes a Vahana of the deity and represents his power and glory as a living and breathing entity. Since the deity is the transcendental power, and we rely upon the mind, intelligence, and the senses to worship him, the image serves both as the material or the physical representation of the deity, and as the connecting link between him and the worshipper. Hence, in Hinduism worshipping the deity or worshipping his Vehicle or Vahana has a positive effect. At times, it is better to worship the Vahana and let him carry your prayers and supplications to the chief deity and act as your messenger. The body of each living being is a product of Nature and contain various organs and energies, which manifest as emotional states, tendencies, attitudes, instincts, desires, and passions. Some of them are positive and some negative. Depending upon how they are used and who controls them, the beings are subject to the law of karma and the cycle of births and deaths. The knowledge of the Vehicles and their presiding deities helps us keep our animal passions under control and transform our minds and bodies to progress on the path of liberation. The human body is considered a temple in the Upanishads. It is meant to be the house of God, and the vehicle of the soul. If the body becomes a Vehicle of the demons, the being comes under their influence, and through evil acts and indulgence falls down into the darker worlds. On the contrary, if the body becomes a Vehicle of divine forces, it becomes an instrument of God and serves his aims in ensuring the order and regularity of the worlds. From this perspective, the Vahanas represent the corporeality of the embodied souls. Since the deities are present in the human body, by knowing which deity has the control over which energy or tendency, devotees can seek their help to purify their minds and bodies. Hence, knowledge of the Vehicles and their symbolism in spiritual life has a great value. By knowing which type of Vehicle your body represents and which energies are predominant in it, you can work for your spiritual transformation. Just as you invoke the presence of a deity into an image saying "avahayami", you can invoke him or her in your body for an internal ritual (manasa puja). Further, if you have any physical or mental ailment, you can invoke the appropriate deity through prayers and worship to manifest in you and resolve the problem. For example, if you are prone to excess anger, or cruelty, you can invoke the power of Chandi or Durga or Kali, to reduce your anger. Those who have excess passion or lust, which is symbolically represented by the bull, can invoke Lord Shiva who is its controller. Those who suffer from fear and self-doubt, which prevents them from taking initiative in reaching their goals, can propitiate Ganesha who controls fear, nervousness, and hesitation represented by the rat. Similarly, if you want to overcome fear of death, you can worship Shiva or Kumara who have control over death, as represented by their control over poisonous snakes. Anyone who is suffering from loneliness or dejection or adversity, which are symbolically represented by the owl, can worship the goddess Lakshmi and seek remedy. 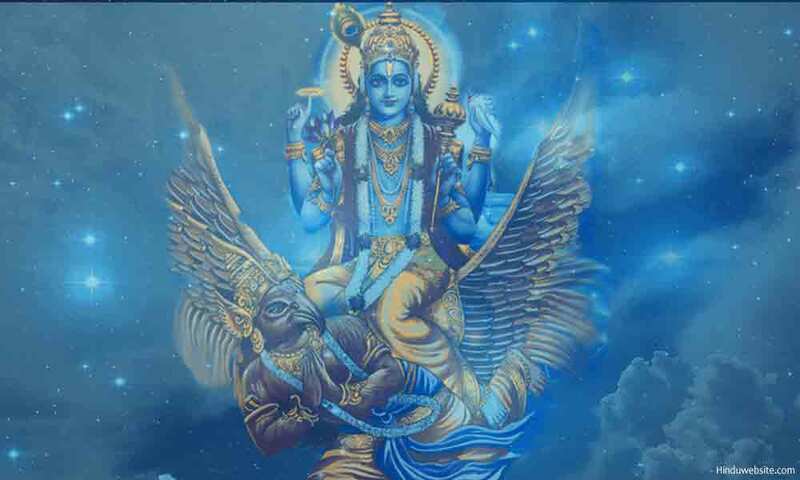 Vishnu is the ideal god for those who want to develop sharp intelligence, discernment and quick thinking because as the ruler of space who keeps a close watch on the entire existence, he travels swiftly at the speed of thought on his Vehicle Garuda to help people, and restore order. Just as gods, the Vahanas have colorful names, attributes and super human features. Offerings are invariably made to them where the principal deity is worshipped, and worship remains incomplete if they are ignored. There are shrines which are exclusively built for them. As is evident from the table shown below, some gods may use more than one Vahana. The Vahanas or Vehicles of various gods and goddesses are listed below. Saraswathi Hamsa or swan or sometimes peacock. The following is a brief discussion of the symbolism of the Vahanas used by the most popular gods and goddesses of Hinduism, what they represent, and how they can help you in your self-transformation. Hamsa (swan) is the Vehicle of Brahma. It stands for discerning intelligence (buddhi), purity, judgment, skill, grace, knowledge, and creativity. The word "Hamsa" is a combination of two words, "aham"+ "sa." It means "I am he." This awareness that one is God exists only in enlightened people. Rightly Brahma is the friend and philosopher of all the enlightened beings in the world, and he has the power to give us this knowledge about our true nature. The bird hamsa is also very beautiful, peaceful and graceful. It suggests that Brahma is the master of all the beauty and grace of the world, and he can help us in our effort to acquire these qualities. It is also believed that the bird has the capacity to separate milk from water. This symbolically means that Brahma can help us to transform our intelligence, or the buddhi, or our ability to discriminate between the right from the wrong so that we can select the correct path to achieve salvation. The bird moves in waters, especially lake waters that are placid. The water symbolically stands for our consciousness and the lake itself for a limited consciousness such as ours. Brahma moves in our consciousness on his Vehicle hamsa and purifies it with his touch and grace. If you want to develop super fine intelligence, you should worship Brahma and invoke him in you during meditation. Goddess Saraswathi is the consort of Brahma. She is shown riding either hamsa or a peacock. Saraswathi is the goddess of learning. From education one gains knowledge and the refinement of character. The peacock is a gentle and beautiful bird which is known for its beauty, elegance, poise, and dancing skills. It suggests that you have to seek the help of Saraswathi, if you are pursuing higher education, fine arts, aesthetics or culture (Sanskriti). The peacock also eats snakes, which symbolically means that with the help of Saraswathi you can control your desires, passions and fear of mortality. Lord Vishnu is seated on Adi Shesha, the primal serpent deity, who represents in us materiality and desire-ridden consciousness. Lord Vishnu can help us either to fulfill our desires and chief aims of human life or control them. His Vehicle is Garuda, the divine bird, which symbolically represents the human thoughts. Just as Garuda travels in all directions at incredible speeds, our thoughts also travel at incredible speeds. Hence, if you want to control undesirable thoughts and stabilize your mind, you should invoke Lord Vishnu. Maha Lakshmi is the goddess of wealth and abundance. Interestingly she has the owl, called Uluka, as her Vehicle. People do not want owls to enter their homes, but everyone wants the goddess of fortune to visit them and grace their homes. This presents an interesting contrast, and for a reason. The owl is a solitary creature, which remains awake during nights, but asleep during daytime. In other words, it is awaken in darkness and asleep during daytime. Thus, the owl shares a very important quality with the seers and sages or the awakened souls. As the Upanishads, affirm, the enlightened ones are awake when others asleep and they are asleep when others are awake. Therefore, for the world, the owl may be an inauspicious symbol, but in truth it is an awakened master. Secondly, like the ascetic seers the owl prefers living in isolation and seldom seen in the company of people or any other bird. Indeed, it stays away from everyone as if it has no interest in the world or the humanity. Thus, the goddess Lakshmi represents wealth and abundance, her Vehicle represents detachment and renunciation. It means if you have wealth or if your pursue wealth, you should practise detachment and renunciation and use the money for the welfare of the others. Those who pursue riches should be aware of their attachment to wealth and pray to the goddess to inculcate in them the qualities of detachment, renunciation, selflessness, and get rid of ignorance, greed, selfishness, envy and malice so that they become truly awake in the darkness of death and adversity. The owl is also regarded as an inauspicious symbol. If people see an owl or if an owl enters a home, it is considered an inauspicious omen. Goddess Lakshmi has the power not only to bestow wealth upon her devotees, but also to neutralize ill-omens and adversity. Thus, her association with the owl also symbolizes her ability to ward off evil omens and adverse conditions. Lord Shiva rides the Bull, Nandi, which stands for the bullying, aggressive, blind and brute power in man. It also stands for unbridled sexual energy, kama. Only Lord Siva can help us control these and transform them. They are usually manifestations of excessive tamas in the body. By invoking and worshipping Shiva one can get rid of them. Thus Shiva can transform a wild bull into a gentle and enlightened Nandi. Shiva is also considered a healer. The Vedas address him as a divine healer and point to his power over death caused by snakebites, calamities, diseases, etc. Hence, those who suffer from chronic diseases, or physical ailments, may pray to him for relief or protection from toxicity in the body, pain, suffering, and death. Parvathi, the consort of Shiva has numerous forms and aspects, which are both benign and fierce. When they are together, generally you do not see them using any Vehicle. It is because for Shiva, Shakti is the ultimate Vehicle, just as the body is to the soul. However, when she is shown alone as Durga, Chandi, Kali, Uma, or Shakti, she is usually shown as riding a tiger or a lion. Both the animals symbolically represent anger, rage, fury, cruelty, dominance, violence, and aggression. The goddess can help those who possess these qualities and indulge in violence and cruelty. Ganesha or Ganapathi is considered the first of the gods and leader of the Shiva Ganas (brigade). He has a large body with the head of an elephant. Interestingly, he uses a tiny creature, rat as his Vehicle. Physically you cannot imagine an elephant riding on a small house rat. However, deep symbolism is hidden in their association. The rat symbolizes, timidity, nervousness, weakness, hesitation, fear, and self-doubt. They are largely responsible for our failures in our lives, and our inability to complete the tasks we start. Fear prevents us from taking initiative and completing tasks. Lord Ganesha is known as remover obstacles. He does it by addressing our fears and helping us to control them. Therefore, if you are suffering from fear and self-doubt which are preventing you from taking timely action, you should pray to Ganesha to remove your fear and negativity and instill confidence and courage. Thus, we can see that the Vehicles of the gods and goddess of Hinduism symbolize our bodies and various energies that are present in them which can be transformed or channeled for righteous ends by propitiating their presiding deities. The Vehicles convey the deeper and hidden wisdom about the importance of seeking divine help in your physical, mental, and spiritual transformation, and your material Wellbeing. You can use the knowledge to purify your mind and body, change your circumstances or overcome obstacles.